It was supposed to be a good day. I added another year. So did my older sister birthday mate. I was grateful for a fruitful year. I was ecstatic to spend the day receiving well wishes from all my loved ones. Today was supposed to be my Happy Birthday...and nothing else. My phone was beeping all day...my charger was probably tired of doing its job. But This beep was different. It was a Washington Post breaking news alert. 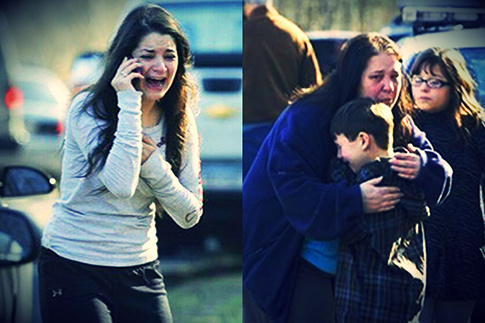 It read "At least 27 people are dead, including 18 children, in a shooting at an elementary school in Newton, Connecticut". What?!? "Oh Lord not again!" These innocent children. These pain-stricken parents. Not just before Christmas! Today, while being gracious for the blessing of witnessing another birthday, my whole being is overwhelmed with grief for the 18 sets of parents who said "See you later" to their children this morning and would never see them alive. My heart weeps for the children, all between 5 and 10 years, who probably spent their last moments in disabling fear. I can't help but ask myself what world will my unborn children come in? Are we ever safe? What would ever justify this mass loss of innocent lives? Why do we continue to be plagued with tragedies perpetuated by people who live among us. Why do these shootings occur in schools, a "supposed" learning safe haven? So many unanswered questions. As we try to make sense of this great loss, we must take time to pray for the lost souls and more so, to appreciate life and the people in it. Even the President weeped.... "Our hearts are broken today....they had their entire lives ahead of them....as a country we have been through this too many times...these neighborhoods are our neighborhoods and these children are our children". I pray for all the innocent darlings who lost their lives today. I pray for all the teachers and administrators who truly gave up their lives to protect the children. I pray for all the families who will spend Christmas with one less person. I pray for the surviving children who were prematurely robbed of their innocence today. May the souls of all those who died today in the Newton Connecticut school shooting rest in perfect peace. Only God can grant all those grieving grace and peace that passeth all understanding to survive this loss. Full story and updates here.